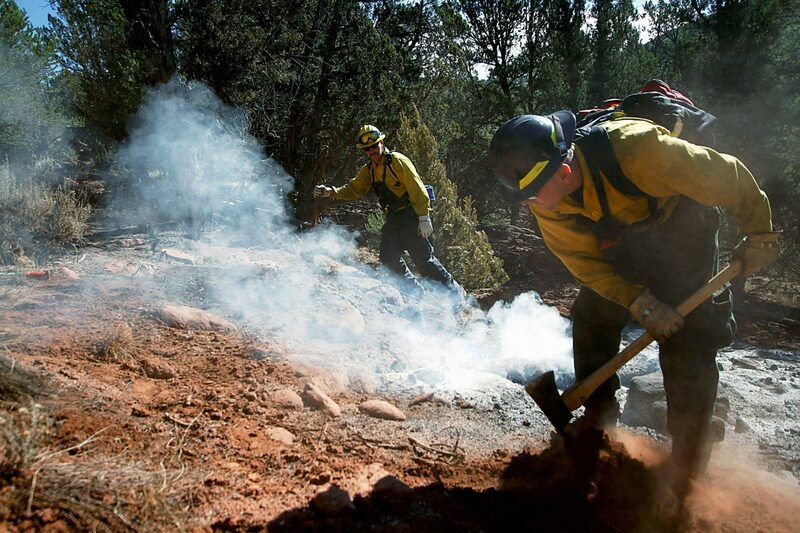 Heavy snowpack and a wet spring will mean less wildfire risk than usual as the fire season ramps up in western Colorado, according to the National Interagency Fire Center (NIFC), but that doesn’t mean local fire agencies are letting their guard down. “You never quite know what you’re going to get so you have to train for the worst and hope for the best,” observed Josh Graham, acting fire management officer for the Upper Colorado River Interagency Fire Management Unit (UCR). The UCR is a cooperative effort between the Bureau of Land Management (BLM), National Forest Service, and National Parks Service, and works with state and local fire agencies to combat wildfire across 6.7 million acres of land in western Colorado. The organization has seen a couple of tough fire years and is already battling its first major wildfire of 2014 near the Utah border. Preparations for the coming wildfire season have included conducting several controlled burns in Battlement Mesa, West Divide Creek, and on Basalt Mountain, and assigning a smokejumper contingent to the area to extinguish small, remote fires early. The National Weather Service predicts above average precipitation across northwest Colorado for May, June, and July. NIFC’s forecast for the UCR’s area anticipates a return to normal conditions in August and September. Officials expressed particular concern for lower elevations, including the valley floor. Although fuel moisture is currently above average, lighter fuels like invasive cheat grass, which is common throughout Garfield County, can dry out quickly and increase fire danger after just a few hot days. Furthermore, recent construction has increased the valley’s wildland–urban interface, a dangerous boundary zone where abundant fuel combines with home density to up the stakes for firefighters. Boyd stressed the need for basic fire precautions like fully dousing campfires and properly disposing of cigarette butts. Glenwood Springs Fire Chief Gary Tillotson worries that the wet spring might cause people to forget some of the lessons learned in recent years. Tillotson’s department stopped issuing open burn permits in mid May. It also looks like it’ll be another year without official Fourth of July fireworks in town. Like several local fire chiefs, Tillotson is taking the long-term forecast with a grain of salt. “My crystal ball is a little cloudy,” he quipped. According to Boyd, July is the busiest month for wildfire in western Colorado, although many of the area’s largest blazes have occurred in June and can take place in any month of the year. Statewide, areas of greatest potential for wildfire is in southeastern Colorado, where severe drought conditions continue, and southwest Colorado, where snowpack values are below average.